Every 6 months, Microsoft releases a major update to Windows 10. To be more precise, it is better to identify Windows 10 releases with version numbers (1503, 1511, 1607, 1703, 1709, 1803 and 1809). The format is the year and month of the release, so 1503 is March 2015 and 1709 is September 2017. Microsoft provides ongoing support for the newest 3 versions. When Windows 10 (1803) was released, Windows 10 (1607) support ended. Since Microsoft is releases new versions of Windows 10 on a semi-annual basis (every 6 months), the shelf life for a new Windows 10 version is roughly 18 months. 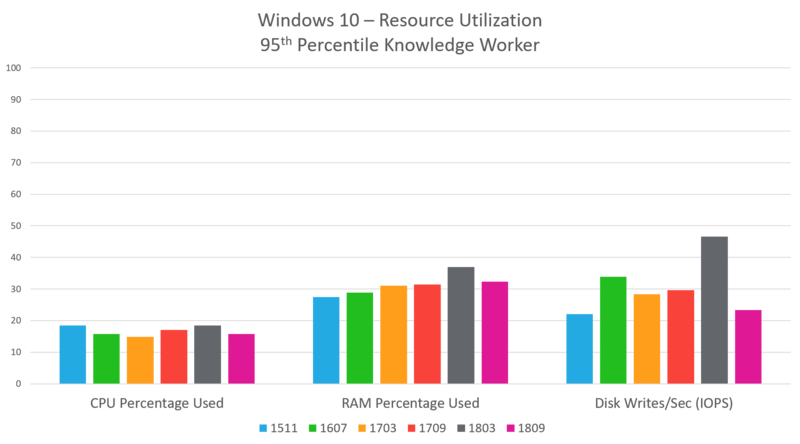 Let’s take a look at CPU, RAM and disk utilization for different Windows 10 versions. These are default installs with no optimizations. The utilization trend, across all three categories is up. Each new version consumes more resources, which makes sense. With each new version, Microsoft introduces new functionality to take advantage of the latest technologies. These features have an impact on the CPU, RAM and disk utilization. However, with the rerelease of 1809 (first release of 1809 was pulled due to many issues), the performance numbers shows a noticeable improvement from previous releases. When a user logs on, they have less RAM to start with than they did with a previous Windows 10 version. This is why it is important to optimize the operating system (removing things we do not need), which can bring these numbers down. At a minimum, we should at least be looking at optimizing the default applications. Very interesting. I wonder how Win 7’s last version compares to this as well. It becoming so hard to keep up with all these changes for Citrix xendesktop. 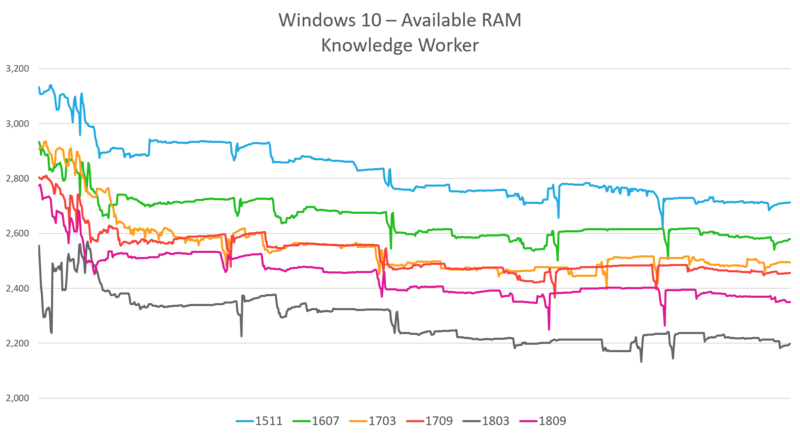 The second chart actually looks like the newer releases of Windows 10 are utilising less RAM which would be more efficient? Or should the chart be named available RAM? Do you have any plans on updating this article with 1809 now that it’s released? Tests completed over weekend. Just updated results.